A place to follow the exploits of the Crafty Cooks team as we teach kids across the country all about the foods we eat and how to turn them into something delicious! Did you know that your ears create more wax when scared? Or that a potato makes an average of 39 crisps? Neither did we… but we do now thanks to the guys and gals at Bear. Today I aged another year and in celebration we had a day planned at Butterfly World in St Albans. I was joyfully woken by the excited pitter patter of little feet and a (quite literally) showering of cards and gifts. Within the pile was a small brown box addressed to me, it had no post mark and I didn’t recognise the handwriting – how exciting! 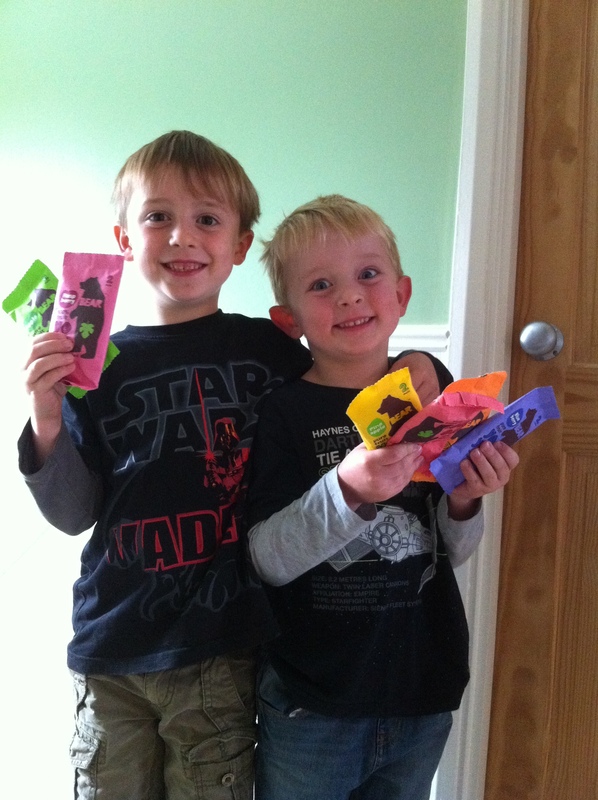 As we carefully prized open the tape the boys started to giggle excitedly for there, within the box, lay a rainbow of fruity Yo Yo’s sent directly from the Bear cave! We had a whole green grocers worth of flavours,strawberry, raspberry, pineapple, apple, blueberry and peach, the boys were in sweetie heaven!! These Yo Yo’s are, in my mind, pure works of genius. the packaging states pure fruit, with no added nonsense. I’ve come to be dubious of such claims but a closer inspection of the apple rolls lists the ingredients as apples, pears and green leafy veg extract – you can’t say fairer than that. They contain no saturated fats, only natural sugars and at just 27cals per roll I may have found my newest favourite snack – it’s not all about the kids! We had a pack there and then and packed a few others for our big advenure, I got the kids to guess the taste and they did straight away, showing both that my children do indeed know how an apple tastes, and also that the yo yo’s do indeed retain the delicious fruit flavour! Butterfly world in Saint Albans was a first for us and we weren’t disappointed, there is a ridiculous amount of open space, amazing tunnels and secret gardens to explore along with a wonderful play area and of course butterflies. Beautiful butterflies of all shapes and sizes fluttering around you, they also do great insect handling sessions with cockroaches, stick insects, a huge snail and various other creepy crawlies! The highlight though for my seven year old, was the ant house, a large area just for the leaf cutter ant where they spend their days cutting leaves and carryinging them over their big rope bridges to the greedy queen ant that sits in her lair getting fatter and fatter by the day! The boys ran around like mad things lapping up both the autumnal wind and the not so secret stash of aformentionned yo yo’s! 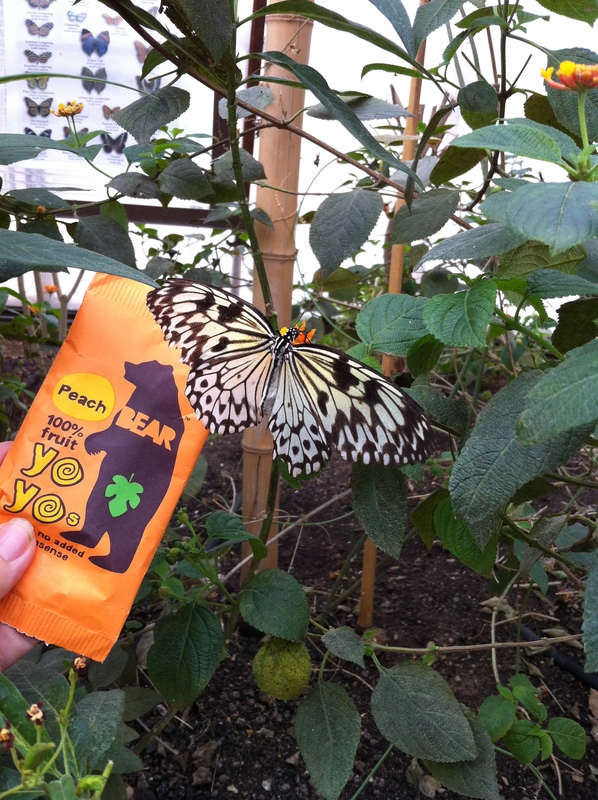 They were so good infact, even the butterflies wanted some! Living and working with small children means we’re always on the look out for exciting new products and concepts. Anything that makes being a mum, and a healthy one at that is of great interest to us so keep your eyes open here for our newest discoveries and if you have anything you think we should know about do shout and tell us info@craftycooks.co.uk! Mince pies and chocolate trees! cake – with hidden ingredients! Diwali – through the eyes of a child! Why do I love my job? ?